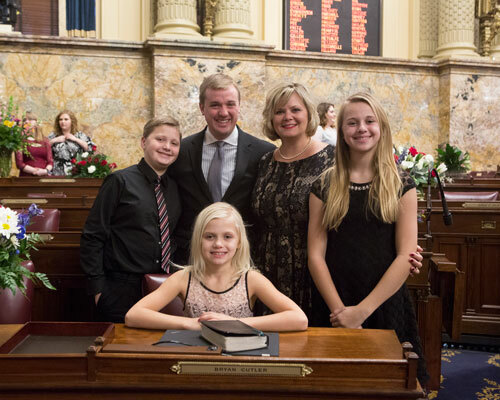 Rep. Bryan Cutler’s wife, Jennifer, and their children, Caleb, Drew and Cheyanne, join him on the House floor during swearing-in day on Jan. 3. HARRISBURG – During the swearing-in ceremony of the Pennsylvania General Assembly held today at the state Capitol, Rep. Bryan Cutler (R-Peach Bottom) was sworn into his sixth term of office as state representative of the 100th Legislative District. Cutler will continue serving as the majority caucus whip with Republicans having the largest House majority since 1958. He is responsible for tracking House votes and informing his other 120 Republican colleagues on upcoming issues and legislation. As well as serving as the majority whip, Cutler plans to introduce legislation supporting employment opportunities for Pennsylvanians with disabilities, increasing penalties for lobbyists with disclosure violations and ending the collection of union political money using taxpayer resources in the new session. He will also work with Department of Health Secretary Dr. Karen Murphy on improving nursing home regulations and patient care. Cutler noted that in addition to his office, residents are encouraged to visit his website at RepCutler.com, his Facebook page at Facebook.com/RepBryanCutler and his Twitter page at Twitter.com/RepBryanCutler. There, they will find information on the latest legislative developments in Harrisburg, state programs and the latest happenings in the 100th Legislative District.